As the Heritage Lottery Fund confirmed a £4.5m National Lottery grant, ambitious and much expanded plans to transform Stockton town centre’s Globe into a live music and comedy venue costing £15m were revealed today. 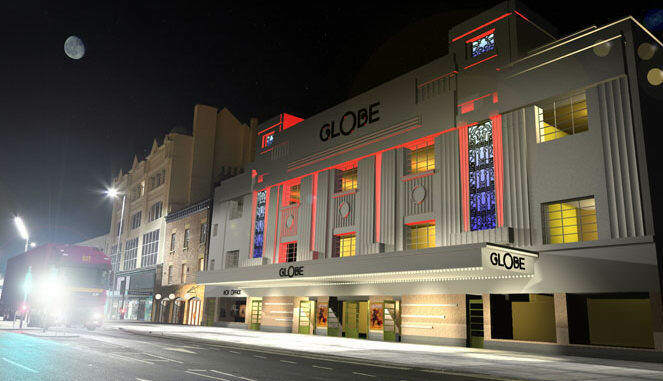 Once restored, the neglected Grade II listed Art Deco Globe will have a capacity of 3,000, firmly positioning it as the largest venue between Newcastle and Leeds, bringing an estimated £18million to the local economy each year and creating more than 250 jobs. A world class operator, set to attract some of the biggest names in music and comedy to the Globe, has also been appointed. Global leader in live entertainment, The Ambassador Theatre Group (ATG), will operate the Globe for the next 25 years. Following detailed investigative work and consultation with operators the restoration project has evolved considerably to meet the operational and business requirements of an internationally renowned operator. The new project will enable ATG to attract some of the world’s best known bands, artists and comedians to the Globe. The new project will cost £15m in total. Alongside £4.5m from the National Lottery, the council will contribute £10.5m. Leader of Stockton Council, Councillor Bob Cook, said: “A project of this scale and nature requires substantial investment to attract world class operators and to be feasible outside of London so we are hugely grateful of the funding from the National Lottery. “We are continuing to see significant investments throughout the town centre including new housing developments, the Hampton by Hilton hotel, the recently formed Business Improvement District and let’s not forget the many investments from smaller businesses like micro-breweries, quirky shops, pet boutiques, coffee shops and restaurants. “The Globe’s restoration is the latest project to come to fruition as part of this exciting masterplan which is driving forward housing, business and cultural growth. The live entertainment venue will create 250 jobs and attract artists and performers who will bring more than 200,000 visitors to Stockton town centre every year – boosting the local economy be an estimated £18m a year. Among ATG’s extensive portfolio are nearly 50 venues in the UK and the USA including historic West End venues like The Apollo Victoria, The Lyceum and The Savoy Theatre as well as the USA’s Broadway Theatre, The Lyric which will soon house the Broadway Premiere of Harry Potter and the Cursed Child Parts One and Two. This new National Lottery money has been awarded through HLF’s Heritage Enterprise programme. It is designed to help when the cost of repairing an historic building is so high that redevelopment is simply not commercially viable.